hillarious..hillarious..poor pup, can you imagine it's thoughts? lol..
Maybe he thought they were lemons and really felt up for tequilla??? Chana -- I think he's in puppy heaven. His thoughts are, "Mine! Mine! All mine!" ALL sorry, typos fixed -- but you've got to know they only helped to prove my point. Someone has played havoc with my "pay-attention". Worse and worse! First you got smiles breaking out all over the place (previous post). Now this. And it's not Christmas, or your birthday (is it? ), or even Feb. 14th. It's an epidemic! We gotta stop this, or happiness will break out everywhere! What's this world coming to?!? OC -- my birthday is in April, it isn't Christmas, it isn't Valentine's Day, but tomorrow is Thanksgiving and this year I'm feeling thankful for butterflies. I love it. Now that's happy. 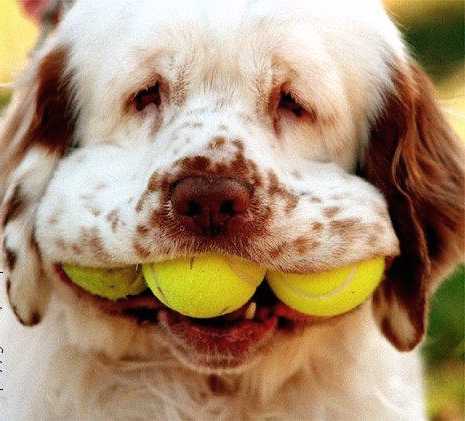 Well, he's got 'fetch' down pat - now someone needs to teach him 'drop it'! ROFL! My dog would SO do that! And would refuse to "drop" even one so we could continue the game! LOL! Nessa -- that's a great smile, isn't it? Jackie -- if he drops them, they will be slimy.